It’s estimated that approximately 75% of diabetic adults have high blood pressure. But according to new research, cutting back on blood pressure medication or blood sugar-lowering medication may be the safer approach for seniors. Adults 70 and older with very low blood sugar and blood pressure levels are at risk of greater episodes of falls, dizzy spells, confusion, and even death. The new retrospective cohort study published in the journal JAMA Internal Medicine suggests that patients and doctors should work together to cut back on medication used for lowering blood pressure and blood sugar. The research team from the University of Michigan Medical School and VA Ann Arbor Healthcare System found that only one in four of about 400,000 older adults who could have been eligible to cut back on their multiple blood sugar or blood pressure drugs actually had their medications lowered. He adds that failing to lower medication when it is necessary wastes money and produces an outcome that is not healthy. The study included 211,667 diabetic patients older than the age of 70 who received blood pressure–lowering drugs or blood sugar–lowering drugs between January 1 and December 31, 2012. The research team analyzed data from December 10, 2013 to July 20, 2015. The researchers found that 27% of the 12,917 patients taking blood sugar–lowering drugs had their medications decreased. Overall, 179,991 patients were treated for diabetes. In 143,305 patients with normal blood sugar levels, 17.5% had their medications reduced. In 23,769 patients with moderately low blood sugar levels, about 21% had their medications reduced. Among the 104,486 patients with normal low pressure, only 15.1% had their medications decreased. Of 25,955 patients with moderately low blood pressure, 16% had their medication decreased. Among 81,226 patients with very low blood pressure levels, only 18.8% had their blood pressure medication reduced. In a survey from the same researchers, about half of 600 physician assistants, nurse practitioners, and doctors said they would lower the medication, in a hypothetical scenario, of a 77-year-old diabetic at risk of hypoglycemia. A third of the healthcare providers believed that their patients may benefit from overtreatment. About 25% were concerned about a lawsuit from treatment reduction, and about 50% were worried that lowering medications in patients who had researched the drugs would lower performance scores on their clinical “report card.” The survey also found that another 20% of the healthcare providers were worried that reducing the medication would upset the patients. Sussman also noted that doctors tend to prescribe drugs to control blood pressure and to focus on the long-term health of their patients. Control of these factors can cut a patient’s risk of other problems linked with high blood sugar or blood pressure levels, including blindness, kidney failure, nerve damage, heart attack and stroke. It can be hard to recognize the signs of too-low blood pressure or blood sugar. Checking blood sugar levels daily and taking multiple medications can be difficult for many seniors. On the other hand, reducing treatment will often provide relief. Sussman, J.B., et al., “Rates of Reintensification of Blood Pressure and Glycemic Medication Treatment Based on Levels of Control and Life Expectancy in Older Patients With Diabetes Mellitus,” JAMA Internal Medicine 2015, doi: 10.1001/jamainternmed.2015.5110. Gordon, S., “Too Many Seniors With Diabetes Are Overtreated, Study Suggests,” MedicineNet.com, October 29, 2015; http://www.medicinenet.com/script/main/art.asp?articlekey=191516. Lipska, K.J., et al., “Potential Overtreatment of Diabetes Mellitus in Older Adults With Tight Glycemic Control,” JAMA Internal Medicine 2015; 175(3): 356–362, doi: 10.1001/jamainternmed.2014.7345. 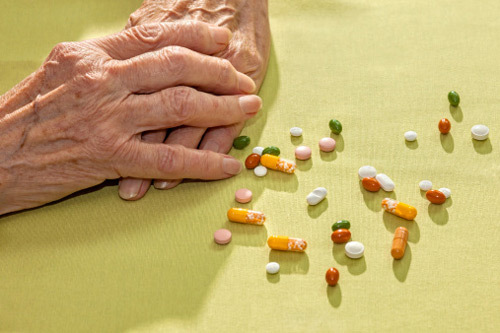 “Too much, too late: Doctors should cut back on some medications in seniors, two studies suggest,” ScienceDaily web site, October 26, 2015; http://www.sciencedaily.com/releases/2015/10/151026112220.htm.